Our first non-family member Etsy sale took place on October 30th, 2010. I remember how exciting it was – a stranger wanted to buy our products! Over the last year we’ve sold just over 700 items. It’s not quite a quit your day job worthy number, but it’s impressive all the same (at least to us). Throughout that time, I’ve been routinely fascinated by the power of Etsy. The site is incredibly far-reaching. As an Etsy seller, that means that our customer base is huge, basically world-wide. That also means that competition is greatly increased, but I think the trade-off is definitely worth it. 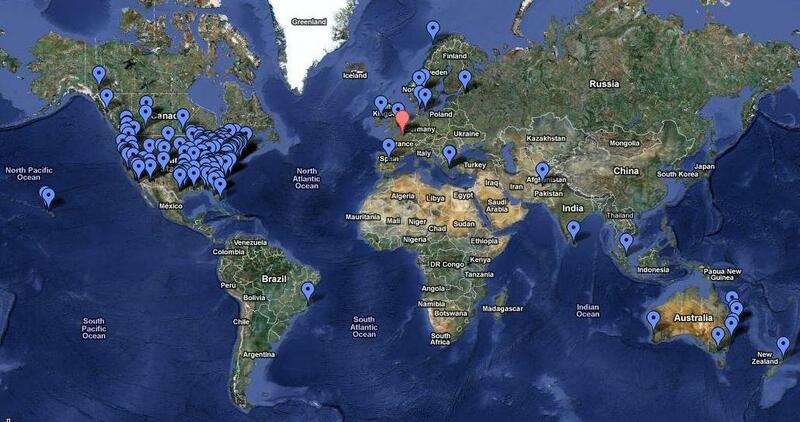 I was curious as to just how far and how many places our products have been, so I created a google map to find out. (You must click to appreciate it….really). Pretty impressive, huh? We’ve sold to many places we’ve been (Cary, NC), many places I’d like to see (Hawaii anyone?) and even one or two that I had never heard of (Twead Heads?). For those who argue that our green living philosophy doesn’t allow for international shipping: we made the decision early on that Belle Terre was to be a sustainable business. Sustainable means many things, but one part of that focus for us is the reality that the business needs to sustain itself by making a modest profit. Cutting off a large customer base was just not an option. So, we’re shipping goods. All over the world. Literally. I hope to be able to add to this map after another year of business on Etsy to see just how far we can go. As always, many many thanks to our wonderful customers (both on and offline) who made this first year of business so amazing for us. With your support, we are building the business we dreamed about and we are forever grateful. PS: After all the time spent adding cities, I found out that Google limits the number of pins on a map. Ooops. So sorry to our friends in the Ukraine who didn’t quite make it and anyone else we may have unknowingly missed.